Piercings are a fabulous form of self-expression. The perfect way to personalize your style. From stylish belly rings to double-hooped nose rings, there are tons of ways to decorate yourself. Visit one of our favorite Nebraska piercing places if you’re looking to get some new hardware. According to its website, Skin Deep has been voted the No. 1 tattoo parlor for several years in Omaha. 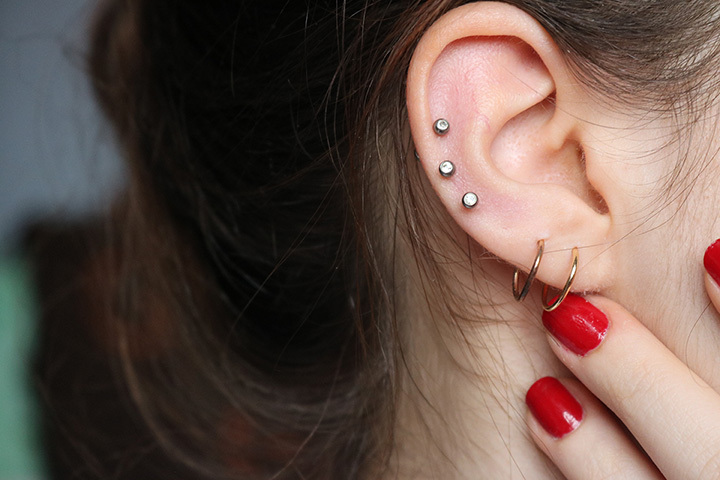 That’s not too shabby—especially because piercing also involves using a needle with skill. Piercings at Skin Deep are accomplished using quality jewelry, ensuring a quicker and safer healing time as well as a more stylish look. At this shop, Eternal applies more to the tattoos than to the piercings. They have a large selection of possible piercing locations, including all of the spots on the ears. Those include the lobes, cartilage, conch, tragus, and industrial. They also offer tongue, lip, spider bites, dermals, eye brows, nose, and more. Sometimes a tattoo is too much of a commitment, but you still want to change your look a bit. That’s the perfect time to get a piercing. Besides being more affordable than tattoos, with piercings you can interchange the jewelry or remove it completely, depending on the look you want. Walk-ins and appointments are available to be pierced at Iron Brush Tattoo. Kearney’s own Olde Towne Tattoo shop offers piercing to its customers as well. Call for an appointment and to ask questions about pricing. Piercings usually run from $35 to $85, depending on location and what jewelry you would like initially. Check out the website for Absolute Tattoos & Body Piercing, they have photos displaying previous piercings they have done that also showcase the spots available to be pierced. The shop is closed Mondays and Tuesdays and is open only for appointments on Sundays. That leaves Wednesday, Thursday, Friday, and Saturday to get pierced. Big Brain has been around from almost a decade now, opening in 2000. They now employ at least eight tattoo artists, with some of them also specializing in piercings. Explore their website online for artist profiles and portfolios. At American Tattoo, their body piercer’s name is Meatloaf. They also have three tattoo artists, and the shop itself has been in business since 1988. They call themselves Omaha’s oldest tattoo studio, which naturally means they have the most experience serving Omaha customers. Visit the website to view portfolios. The clever name is enough to attract customers, let alone their prowess with needles. Get tattooed or pierced by Jeremiah Connor, Sergio Arreguin, or Ben Matheny; each his their own specialty and strength. Stop in the studio for a tour and preview of the artists’ portfolios. At Precision Piercings they offer quality implant titanium jewelry. They also do anodizing, which is changing the color of the metal. Besides the jewelry they offer, they also exemplify quality customer service and perform professional body piercings. They start at $25.